S. B. Althause & Co.
No. 101 & 103 Thompson St. In 1888 Charles S. Harrower writing the biography of John Black Cornell wrote, "His eldest brother, George, was at the time the head of the iron firm of Cornell, Althause & Co. Their business was to make grates, fenders, railings, safes, shutters, bedsteads, doors, etc. They were the successors to Benjamin Birdsall, with whom they had learned their trade, and who was the pioneer in this line of iron working in this country." The eldest brother, George, was George Cornell (1807-1847), a brother of John B. Cornell and William W. Cornell who formed the firm, J. B. & W. W. Cornell, one of the best known of all New York City iron foundries. Formed in 1847, J. B. & W. W. Cornell was succeeded in 1870 by J. B. & J. M. Cornell, also extremely well known. Some of the history of the Cornell companies is outlined at cornelliron.com. Benjamin Birdsall (ca.1775-1853) was an early 19th century blacksmith, whose business was taken over by George Cornell and Samuel B. Althause in 1828. Their company, Cornell, Althause & Co., can be traced through New York city directories from 1828 to 1841. Samuel Birdsall Althause (1805-1862) was the first of three generations with this name. His mother was Elizabeth Birdsall, the daughter of Benjamin Birdsall. This first Samuel B. Althause appeared in the U. S. Census of 1850 with his wife, Helen, and sons, John J. Althause, age 21, and Samuel B. Althause Jr., age 19. His foundry, S. B. Althause & Co., succeeded his partnership with George Cornell in 1841/42, and was located at 443 Broadway and 20-22 Mercer St. until the mid-1850s. From 1856 through 1860 only the Mercer St. address appeared in city directories. Then from 1861 to 1883 the foundry was located near the corner of Greene St. and Houston St. In 1884 it was moved to 101-103 Thompson St. (a block and a half south of Houston). S. B. Althause & Co. operated from this address until it closed around 1902. This account from www.bklyn-genealogy traces the life of John Althause, a loyalist during the Revolutionary War: "Richard JACKSON ALTHAUSE, Jane JACKSON and John ALTHAUSE’s son married Elizabeth Birdsall daughter of Col. Benjamin Birdsall and Freelove Jones they had 2 children Samuel Birsall ALTHAUSE and Jane Elizabeth Althouse Jane Elizabeth married John Gilbert Seaman, Elwood Althouse married his sister Sarah Seaman, they were both children of John Seaman and Mary Whitson. Samuel Birdsall ALTHAUSE married Helen Welling Sealy, he apprenticed with his grandfather Col. Benjamin Birdsall at his Ironworks and took over the company after Benjamin retired, Samuel B. ALTHAUSE moved to Brooklyn was among the weathiest [sic] New Yorkers in 1850, he died in 1862 and his sons including William Henry ALTHAUSE ran the Iron Works until 1900 when it closed." Spelling, punctuation and some of the grammar leave something to be desired, but this account does establish the relationship of the first Samuel B. Althause with Benjamin Birdsall. Birdsall was his maternal grandfather, his father being Richard Jackson Althause, and his mother being Elizabeth Birdsall, Benjamin Birdsall's daughter. This ad for Cornell, Althause & Co. dates from 1840. The two addresses, 443 Broadway and 22 Mercer St., continued to the locations of S. B. Althause & Co. from 1842 to 1854/55. This ad for S. B. Althause & Co. dates from 1854, when their address was 20-22 Mercer St. Proprietors were Samuel B. Althause and Nicholas Ludlum. At this date the ad does not mention ornamental architectural products. This ad for Althause Iron Works dates from 1876, when they were on Greene St. near Houston. Proprietors were John J. Althause (1829/30-1891), the second Samuel B. Althause (1831-died after 1900), and Elijah P. Leonard. 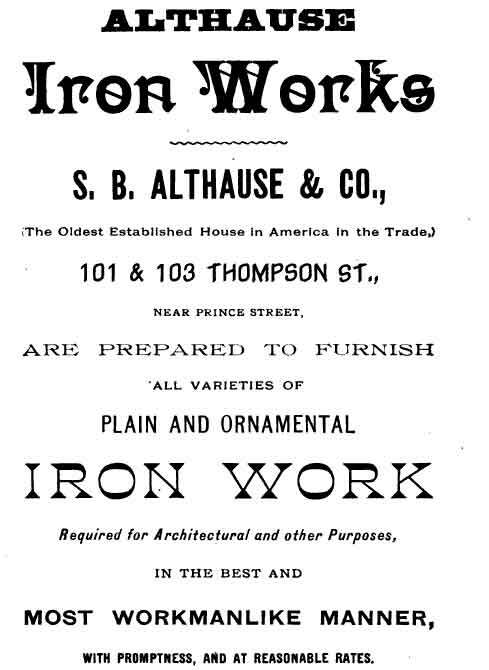 This ad for Althause Iron Works dates from 1887, when they were located on Thompson St. In the mid-1880s as many as five Althauses were working at the foundry. These included Samuel B. Althause Jr. (1831-? ), Samuel B. Althause III (1860-1938), John Jackson Althause (1829/30-1891), and two of the John J. Althause's sons, Edwin J. Althause (b. 1851) and Walton Cotton Althause (b. 1858/59). The 1880 U. S. Census (non-population schedules) recorded S. B. Althause, Iron Foundry. This company owned $16,000 in capital and raw materials worth $37,296. They employed as many as 27 workmen, including 18 males above the age of 15, and they paid $10,800 in annual wages. The ordinary work day was 10 hours, and a skilled mechanic was paid $2.00 per day. They were in operation 12 months per year. The plant used two boilers for one steam engine with a total of 18 horsepower. The value of the previous year's production was $53,472. 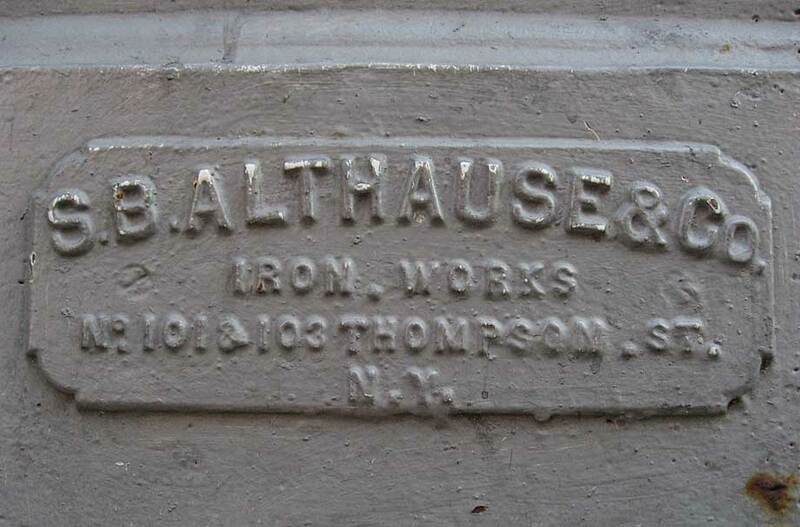 In 1888 S. B. Althause & Co. were described as follows in Illustrated New York's The Metropolis of To-Day, "Althause Iron Works, S. B. Althause & Co., Proprietors, Nos. 101 and 103 Thompson Street, near Prince.-This is the oldest and one of the best known manufacturing concerns in the country. It was founded as far back as 1825, and has thus been in being for a period of sixty-three years. The proprietors of the concern are Messrs. Samuel B. Althause, Elijah P. Leonard and Walton C. Althause, all of whom are natives of New York State. The works are located at Nos. 101 and 103 Thompson street, and are thoroughly equipped with all the latest and most effective mechanical appliances. From thirty to thirty-five skilled and experienced artisans are permanently employed in the manufacture of all kinds of plain, ornamental and architectural ironwork..."
An iron remnant located at 116-118 Franklin St. marks either Althause & Co. vault lights or a rim for vault lights.